To Fight Antibiotic Resistance, Scientists Look To Microbes In Insects : Shots - Health News With the rise of antibiotic-resistant infections, scientists are exploring nature to find new disease-fighting compounds. They're finding them in surprising new places: the microbiomes of insects. 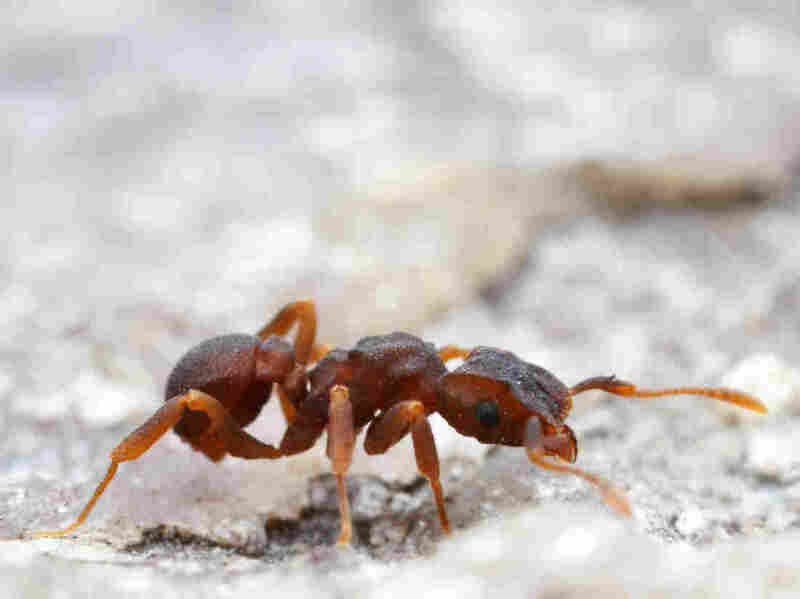 Scientists have isolated a molecule with disease-fighting potential in a microbe living on a type of fungus-farming ant (genus Cyphomyrmex). The microbe kills off other hostile microbes attacking the ants' fungus, a food source. Nobody likes a cockroach in their house. But before you smash the unwelcome intruder, consider this: that six-legged critter might one day save your life. That's right. Insects—long known to spread diseases—could potentially help cure them. Or rather, the microbes living inside them could. Scientists have discovered dozens of microorganisms living in or on insects that produce antimicrobial compounds, some of which may hold the key to developing new antibiotic drugs. They can't come too soon. More infections are becoming resistant to common antibiotics, and the pipeline of new antibiotic drugs has slowed to a trickle. "There is a growing demand [for antibiotics], and a diminishing supply," explains Gerry Wright, who directs the Michael G. DeGroote Institute for Infectious Disease Research at McMaster University. Most antibiotic drugs have been discovered from bacteria living in the soil. But Cameron Currie, professor of bacteriology at the University of Wisconsin-Madison, says that searching the soil for new antibiotics has become increasingly futile. "They keep finding already known antibiotics," Currie says. "There's a common sentiment that the well of antibiotics from soil... is dry." Fortunately, there may be another well. Currie and a team of 28 researchers recently published a paper in Nature Communications showing that some of the bacteria living in insects are really good at killing the germs that make people sick. "There's an estimated 10 million species [of insect] on the planet," Currie says. "That implies a huge potential for a lot of new [antibiotic] compounds." Each insect contains an entire ecosystem of microorganisms, just like the microbiome found in humans. And there's one quality that many of those insect-associated microbes have in common, says Jonathan Klassen, assistant professor of molecular and cell biology at the University of Connecticut and an author on the study. They don't get along with each other very well. And by don't get along, he means they're constantly trying to kill each other through biochemical warfare. Many of the microorganisms in insects make compounds that are toxic to other microbes—essentially, natural antibiotics. Some of those natural antibiotics attracted Currie's attention while he was a student, researching leaf cutter ants. Leaf cutter ants are among nature's most prolific gardeners. They actually don't eat the leaves they cut — instead they use them to cultivate a special type of fungus for food. Still, it's not easy being a fungus farmer. "Like human agriculture, the ants have problems with disease," Currie says. "I found a specialized pathogen that attacks their fungus garden." Fortunately, the ants have a tool to deal with the problem. A species of bacteria living on the ants' exoskeletons produces a toxin that kills the pathogen. Like the pesticides a gardener uses, the toxin keeps the ants' garden disease-free. The discovery inspired Currie's curiosity. If ants could use these bacterial compounds to treat disease in their fungus gardens, could doctors use them to treat disease in people? If so, what other insects might also be carrying disease-fighting microbes? To answer those questions, Currie and his team spent years collecting thousands of insects, including cockroaches, from Alaska to Brazil. "Every few months somebody would be going out somewhere to collect something," remembers Klassen, who was working at the time as a postdoctoral researcher on the project. The team tested bacteria from each insect to determine if they could kill common human pathogens, such as E. coli and methicillin-resistant Staphylococcus aureus (MRSA). They then compared the results from strains of insect bacteria to strains drawn from plants and soil. "We were really surprised that [insect strains] were not just as good, but apparently better at inhibiting [pathogens]," Currie says. Once a scientist has discovered that a strain of bacteria can kill germs, the next step in drug development is to determine what bacterial compound is responsible for the antimicrobial activity—like a cook searching for the secret ingredient in a particularly delicious soup. Currie's team had found dozens of promising bacterial strains in insects. And each could yield a secret ingredient that might be a new antibiotic compound. That in itself was a big accomplishment. But the researchers went a step further. They isolated one compound from one particularly promising bacterial strain and showed that it could inhibit fungal infections in mice, an important step in drug development. The compound, cyphomycin, is found on Brazilian fungus-farming ants, close relatives of the ants Currie studied as a PhD student. Though it's far from becoming an approved drug, the research shows that antibiotic compounds new to science can be isolated from insects. Wright, an antibiotic researcher who did not participate in the study, says that previous research has shown that single insect species contained antimicrobial compounds. But this is the first study to comprehensively demonstrate that insects as a group are a promising source of new antimicrobials. "No one's ever done something on this scale before," Wright explains. Currie is hopeful that cyphomycin may one day be approved to treat yeast infections in people. But before that happens, it must undergo years of further testing. "It [cyphomycin] is a million miles away [from approval]," Wright says. "That's the reality of drug discovery." Still, Wright says the researchers have already overcome one of the toughest hurdles in drug development by demonstrating that the compound works in mice. For Klassen, the stakes are too high not to try. "Efforts such as this study are crucial to keeping the antibiotic pipeline flowing so that disease doesn't gain the upper hand," he says. In the end, the consequences of a world without antibiotics are enough to make scientists look for new drugs in unconventional places—even if that means looking in a cockroach. Paul Chisholm is a freelance science writer in Rapid City, S.D. You can reach him on Twitter: @PaulJChisholm.